How many of you watch the safety video on a flight? Air New Zealand, the national airline of New Zealand, released a safety video that many of you will surely watch. The video has a Hobbit-theme, and also some actors from The Lord of the Rings films. An American band called OK Go recently released a neat music video. You can watch both the videos here. 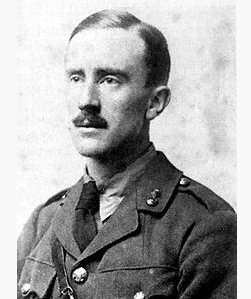 The Hobbit was written by John Ronald Reuel Tolkien (image above). It was published in 1937. The sequel was The Lord of the Rings which was published in three volumes in 1954 and 1955.